With the threat of winter weather and freezing temperatures predicted for Middle Georgia the next few days, Macon-Bibb County Animal Welfare wants to help you keep your pets safe. Below are some essential tips to help. 1. Your pet should have comfortable spots in both hotter and cooler regions of the house. This will allow them to move around at night if they are uncomfortable. 2. Never shave your dog/cat down to the skin in winter, as a longer coat will provide more warmth. If your dog/cat is long-haired, simply trim them to minimize the clinging ice balls, or salt crystals. 3. Bring a towel on long walks to clean off stinging, irritated paws. After each walk, wash and dry your pet’s feet and stomach to remove ice. 4. Bathe your pets as little as possible during cold spells. 5. Massaging petroleum jelly or other paw protectors into paw pads before going outside can help protect from salt and chemical agents. 6. Pets burn extra energy by trying to stay warm in wintertime. Feeding your pet a little bit more during the cold weather months can provide much-needed calories, and making sure they have plenty of water to drink will help keep them well-hydrated and their skin less dry. 7. Remember, if it’s too cold for you, it’s probably too cold for your pet, so keep your animals inside. In addition, don’t leave pets alone in a car during cold weather, as cars can act as refrigerators that hold in the cold and cause animals to freeze to death. 8. Some medical conditions will worsen when it gets colder out; one of the main ones being arthritis. Arthritis might worsen in the cold months because of the direct effect of the cold-increased stiffness. 9. Dispose of antifreeze properly so that neither your pets, nor strays ingest it. Antifreeze is a common cold weather poison, but not the only one to be aware of: road salt and rodent poisons are also used more frequently this time of year. 10. If your pet cannot come inside, be sure to provide them with a shelter outside. Make sure that the shelter is off the ground and has plenty of hay or shavings in it. Make sure the shelter is facing away from the wind as well. 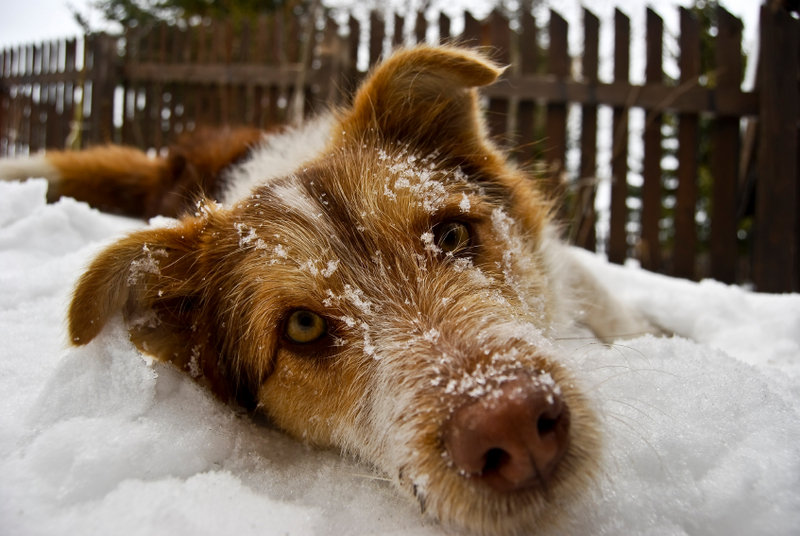 All of these precautions will keep your pet warm, during the winter weather.